Things to do near Bournemouth with kids! Swanage is a proper old-school English seaside town. In the winter it is practically abandoned and the streets glisten with drizzle as if they’ve been varnished. In the spring and summer it’s a buzzing hub of happy people, locals and tourists, scoffing scones at the cafes on the sea front or fighting seagulls off their chips. We usually park on the pier at the far end of the town and have a walk along it, chatting to the fishermen dipping their lines in the water underneath. Often we picnic here too, the kids with their legs dangling over the side; it saves sand getting into the sandwiches and is a lovely spot to just watch the world go by. We also bring buckets and spades so we can head down to the sand after our picnic, and the kids spend ages making sand angels, burying their toys and crying when they can’t find them again. Ahh, we love this place! It’s actually called Durlston Country Park and it has some beautiful walks through wild-garlic filled woods and along the coastline. We always go inside and check out the nature exhibits in the entrance hall. They have a nest cam live on screen, so you can see mama birds bringing food for their chicks in real time! There are also those creepy boxes where you have to put your hand in and guess what’s inside, like a deer skull or chunk of driftwood or something. They usually have events on for kids; sometimes there is a large sandpit with ‘dinosaur bones’ buried for them to unearth, or a screening of an interesting nature film in the little cinema room. There’s a cafe with a fab view and on the top floor is a playroom with panoramic view of the ocean. Depart from Bournemouth and see Durlston Castle, Corfe Castle, Lulworth and Durdle Door and take a ferry ride with this great value day tour! 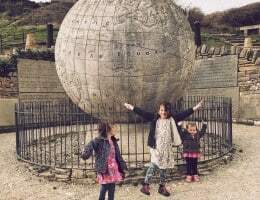 The huge stone globe at Durlston Castle! This tumble-down ruin is an ancient treasure and is maintained and run by the National Trust. Visitors can fuel up on scones in the cafe by the entrance before hiking all the way to the top of the ruins. There is a kids’ trail where children can answer questions dotted around the buildings to win a medal or wristband and in the summer holidays there are re-enactments of battles, actors doing shows about medieval life and even birds of prey displays! We particularly loved the festival a couple of summers ago where the kids got to make mosaics out of clay tiles and watch carpenters make weapons out of wood and bone. 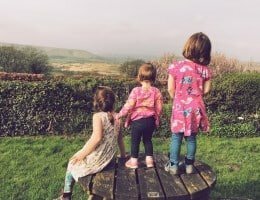 Whilst you are in Corfe visit the adorable miniature village and games lawn at Corfe Castle Model Village; our kids play in there for hours and the Dorset apple cake is to die for! Be still, my beating heart. The Salt Pig in Wareham is the most amazing little eatery; all of the produce is from within a few miles so it is always in season and uber-fresh. They do super high quality versions of kids’ picnic favourites and in the evening open as a homely restaurant for which the menu changes every week. For Mothers’ Day this year I took my Mum to have a 10-course tasting menu at a new event run by The Salt Pig and it was some of the best food I’ve had in my life! Located on Wareham High Street, you have to check it out if you are in the area. Dorset, and indeed England, is full of old-worldly country charm. We love driving through villages of stone cottages and ramshackle pubs and often stop to admire the views from the crest of a hill. The Scott Arms pub in the tiny village of Kingston has one of the best views around; the scenery from the beer garden is so good that the pub’s tagline is “Drink in the view”! The beer garden is huge so it is a great option for parents to chill with a drink whilst the kids stretch their legs. See and do everything with this 3 day tour from Get Your Guide, taking in Stonehenge, Dartmoor national park, Bath, the Jurassic Coast and more! What kid doesn’t love an open-top bus? Enjoy stunning views of the coast with this family friendly tour and take in Bournemouth, Christchurch and Poole (with plenty of time for ice cream stops along the way!) This oh-so-British red double-decker bus is the perfect way to explore Bournemouth and beyond. This spacious country park is free to visit and is a great day out for the whole family. Kids can run and play in the woodland and play areas; there’s even a fountain area to play in on warm days. A charming cafe serves lunches and local ice-cream and there are fun children’s trails and educational days such as Roman Village life also on the calendar. A kid-sized theme park, Adventure Wonderland is a fantastic day out for toddlers and young children when you are looking for things to do near Bournemouth. Characters from Alice in Wonderland will walk around and interact with guests, even riding on the rollercoaster with brave little ones! There are plenty of rides as well as a large indoor play area so it’s a good option on a day when the weather may not play ball all day. Tickets for adults and children aged 3+ cost £13.99. A lovely centre for kids with views over Poole harbour and plenty of resident geese! The Ark houses a soft play, a casual cafe, a restaurant, an ice cream parlour and an ice rink with kid-friendly skating accessories. There is space for parties and on Friday evenings there is a ice-skating disco followed by soft play and buffet. If you’re looking for things to do near Bournemouth on rainy days, this is a great option. Choose from 13 slides of varying adrenaline-ratings at Splashdown water park in Bournemouth. There is plenty to do for little ones to teenagers, with three under-5s areas, an outdoor ‘beach’ and underwater reef for little ones to snorkel! There is an on-site cafe so you can tuck into delicious food after working up an appetite in the water. Tickets start at £7. There is a good range of accommodation near Bournemouth for all budgets, from simple campsites to luxury hotels. Use Booking.com or Hotels Combined to get the best accommodation deals and to see the latest rates. Once you’ve finished on the English coast, you’ll want to explore the capital! Check out this guide on things to do in London with kids, including general tips and top recommendations! Have you been to the Isle of Purbeck, or elsewhere in Dorset? Where are your favourite places to visit? If you know of any great things to do near Bournemouth that we’ve missed, let us know! If you like this post you might like reading about our full time travel as a family of six and our stories and travel tips about living in Bali. This page contains affiliate links from booking & tour providers of things to do near Bournemouth that we use and recommend; using them makes us a small commission at no cost to you.